This week's terrorist attack on French satirical publication Charlie Hebdo sent shockwaves throughout France and the world. And while any massacre of any humans is horrific and terrifying, this one particularly hit home with cartoonists, satirists and journalists worldwide. The defiant demonstration of solidarity on the streets of Paris, and the electronic reverberations in tens of thousands of "Je suis Charlie" (I am Charlie) posts, are the only heartening aspects of this sad event. Not surprisingly, cartoonists have responded in force the way they do best: by putting pen to paper. 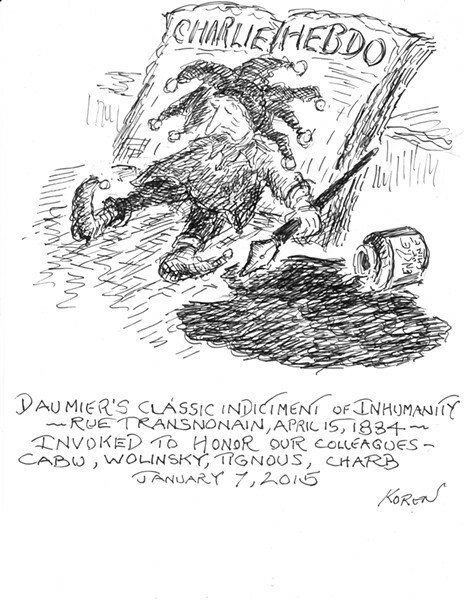 Vermont cartoonist laureate and New Yorker cartoonist Ed Koren shared the drawing above with Seven Days. The reference is to a lithograph by French satirist Honoré Daumier (1808-79), who was the chief draftsman at a magazine called La Caricature. The event to which the drawing referred was a brutal governmental repression that resulted in the killing of a working-class family by government troops. This time, terrorist-censors massacred 12 at a satirical magazine, and now the Paris police have killed two suspects in turn, and another militant. The work of our French colleagues, who were regarded as public intellectuals contributing to the civic discourse, drew on a long tradition of graphic provocateurs and observers, holding the feet of authority and dogma to the fire of high standards and reason. My heart is broken by the loss of so many comrades who fearlessly continued that tradition, whose huge talents are lost to us by such laughless and brutal and ignorant censors. May we all stand with them — Cabu, Wolinsky, Charb, Tignous — mourning and honoring their genius, next to our drawing boards, reaffirming and continuing their work. Added Koren, "The pen — drawing and writing — will continue to be mightier than the semi-automatic weapon."